I had dis one post I waited ovah a year to post and in classic WWD! fashion.... still not ready. I'll seriously try and get it out real soon. For those who work Downtown or drive on Dillingham, it's right undah your nose in plain sight but only for those who want to "see" it will realize it's there.... and plenty of it being shared. I'm truly surprised dat its been out there for, I'm only assuming years, and yet it's still there considering da amount of 'concerned citizens' who like to remove, eliminate or call out things dat bother them. Personally, I think it's cool and I find myself looking for more.... will you? Vacations are supposed to be carefree, worry-free and free of the hum-ding of normal everyday life. Well, let's just say that das not how WWD! rolls. Aftah working 12 straight hours to get as much work as I could in, I rushed home for a red eye flight on Monday. Everything going to plan even aftah rushing to pack my carry on of last minute essentials. We dropped off my mother-in-law and her common-in-law, Da Keiki and Da Baby at da airport then headed back home for my father-in-law to drop Da Wife and I off back to da airport all well before da two hour check in. As we headed out door for da final time, Da Wife was looking for her phone. Naturally we searched in da obvious places: bag and car. She then retraced her steps cause she was showing our house sitter da lay of da land. A'ole. She went through her bag multiple times, she and I searched her car in every nook and cranny (surprisingly it was pretty clean in da places you normally don't look) and even checked da fridge! A'ole. BL: You surah you no have 'em in your bag? Da Wife: (with a frantic look cause she's NEVAH like dis) YES! Da Wife: Let's just go. BL: You serious?! You know you going need da phone so we bettah find it. Da Wife: (25 minutes latah) FOUND IT! Da Wife: You better not blog about this! Wait, das just da first 45 minutes. Having already checked in online and paid for our luggage along with notifying that we had two car seats in tow, we check in again (WWD!) at da Hawaiian Airlines automated kiosk. Aftah getting da same travel documents we already printed at home, our luggage and car seat tags were printed as well. Did I mention dat my MIL wasn't too thrilled dat we were "late". Obviously having two car seats, we get two car seat tags but I guess they nevah saw two car seats packed into ONE box. BL: (looking at da confused kiosk helper) There's TWO car seats in da box. They are flipped like Tetris so it could fit into one box. Da Kiosk Wahine: (still staring at da TWO car seat tags but looking at da ONE box) But the box is oversized. BL: Really? It's a car seat. It's only about six inches bigger than da regular box. (I flipped one box onto da oddah to make a single box) It saves space for you guys instead of having two huge boxes, there's only one. Da Kiosk Wahine: (walks ovah to anoddah agent) They say there's two car seats in there. Da Supahvisah: You have two car seats in there? BL: (explains da Tetris thing again) I can open it up to show you. Da Supahvisah: The box is too big. You have to take it out. BL: But the box is the only thing protecting it - wat do we put it in then? We've had a car seat in a box before. Da Supahvisah: But this is oversized. BL: (nevah like upset 'Da Supavisah' and kept da 'wat about longboards & golf clubs being ovahsized' and way biggah than our car seat box comment to myself) So wat then? We no can take it? BL: We had it in boxes to protect it from being thrown around. Da Supahvisah: Car seats are placed in a special part of the plane. Da Supahvisah: You don't have to rip up the box. BL: Then how am I supposed to get da car seats out? Da Wife: Do you have a knife or scissors? Well, let's just say dat I transferred any aggression ovah to da box. And then da TSA line........... ohhhhhhhh boy. Since wen was it ok to be right on somebody's okole breathing down their neck and literally shoving your things forward with their container from behind? Can't you see our hands were overly full with two keiki, two strollers and carry on's? Ho Brah, I wanted fo'.......... woooooo-saaaaaaa. Aftah all dat, we made it to da gate just in time to board. Aftah a little ovah five hour flight, we land and deplane only to find out dat one of our strollers is missing from da pick up area just outside da plane doors. There's three people standing there so I ask anyone who was listening where one of our strollers was at? One asked wat it looked like and we showed them, "exactly like that one". We couldn't understand how one was brought up but not da oddah? There were both IDENTICAL and I can only assume dat they were placed together in da hold cause they were together right before we boarded. We were just hoping dat no one took it by 'accident' or dat it would be in da bizzaro world of lost luggage but alas aftah about fifteen minutes of waiting, it 'miraculously' showed up. Oh yeah, wen I went to pick up our 'ovahsized' car seats in da ovahsized pick up area, it was placed in da special area all right.... as I heard it being thrown, thunked and partially rolled down da ramp. Classic I tell ya, classic. As my vacation departure date creeps up, I can't help but feel 'uneasy' even before the vacation begins. First thing on my list is trying not to forget anything between packing da right clothes, chargers/cables, cameras (rogah, das plural), documents and of course da phone amongst choke oddah things. With dat being said, I started to think about da things dat have been travel irks to anyone dat has evah traveled. You got of course checking in by which with technology these days you do it online but still have to stand in line to check in your bags... which of course you still got those who are technologically challenged and stand in front of da monitor as if waiting for a Vegas payout. Then da infamous TSA screening lines. I won't go there but c'mon people.... SHOES come off! No can bring watah inside so Hydroflasks have been a welcome addition. Then you get da outlet hogs with their 'gear' spread out as if they were NASA coordinating a space shuttle launch. And then there's da plane. If you happen to have to sit next to strangers, you hope they don't occupy BOTH armrests or encroach on da property line having da occasional uncomfortable nudge with da apologetic nod. And I used to feel especially sorry for those around crying babies. Wat kinda gets me though is those who recline their seats and then try to recline them some more by leaning on it hard every so often as if they are bending it further back! It not only shoves da tray into da passenger in da back, every time they push back it makes da already small space smaller. I read a few months ago dat there are even gadgets dat prohibit da recline of seats in front of you. 😆 Now dat would make for an ugly flight. Wat peeves you at da airport? Da flight? Traveling? Got any solutions, tips or tricks you live by when traveling? I can safely assume at least 98% of da WWD! Hui drive no? We all remembah dat glossy orange bordered booklet full of pictures and multiple choice questions with da 'nostalgic' cover of H1 near University in da early 80's we passed along to family, friends and by da time it came back was all buss up.... but was still around somewea. 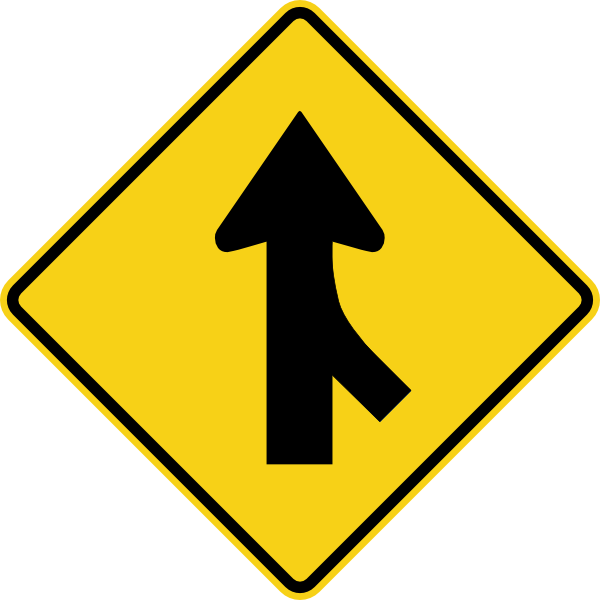 For those needing a refresher, it means "Merge" or "Merging Traffic Ahead". And for those needing an in depth refresher it means dat those on da right hand side will be merging with da main road soon. Let me ask you dis, who has da right of way wen you see dat? I'll let it simmer for those who are guessing right now. Heading underneath da viaduct aftah work, I was in da left lane of da two lane road heading West knowing dat da lane will merge into one soon. As I approach da merge, dis lolo rolls up on da side of me (going about 35mph) and then inches his way just ahead of me as da lanes were merging. Once I seen dat he wasn't going to merge properly, I tapped my brakes to slow and avoid being a smooshed petroglyph. Once da lanes opened up, I roll up along side him and suggest to him to take a driver's ed course cause he just blew through a merge and almost took me out! He proceeds to tell me (pointing to an imaginary sign) dat it was a "Merge". Wassup Wit Dat! No f'in $%!t it was a "merge"! BL: "Yeah Brah, it was a merge, YOU have to YIELD!" IDIOT: "No, I don't.... YOU have to!" I couldn't believe dat he just said dat. Funny thing is dat there's actually an "IGNORANCE" section in da Hawai'i Drivers Manual and da first of five noted "bad" driving categories is "Failing to yield to pedestrians or other vehicles having the right of way." For those trying to look for your buss up copy of da manual, consider dis a $5.50 gift..... or you could just send ovah a mini plate lunch instead.